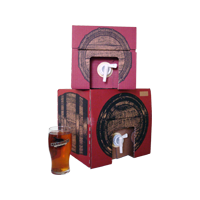 Elgood’s Beer Polypins are sturdy polythene containers protected by a cardboard box. Ideal for parties because they don’t need to settle like traditional kegs and can be used straight away. Elgood’s Polypins are available in two sizes, 17 pints and 35 pints. Please Note: Polypins are filled with our award-winning ales on the day of despatch. In order to enjoy our beers at their best, we recommend consumption within 5 days of delivery.